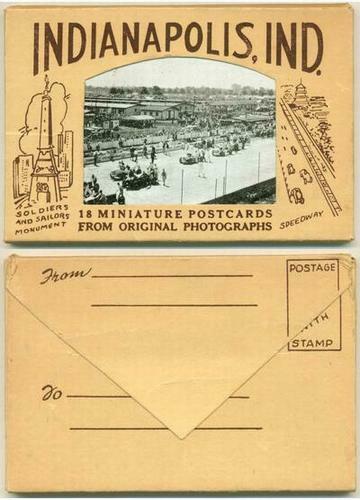 This item is a packet of 18 miniature views. Each card measures approximately 4-1/4 x 3 inches. 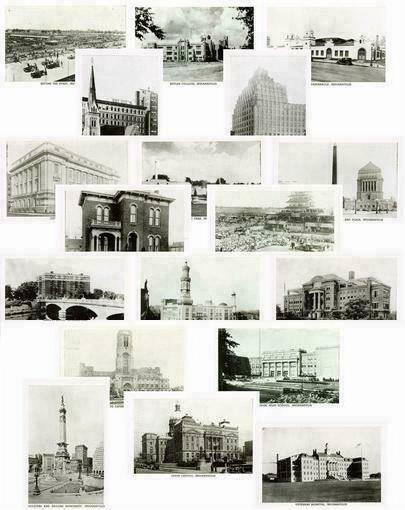 Views include: Before the Start ; Butler College ; Cadle Tabernacle ; Christ Church ; Circle Tower ; City Hall ; Garfield Park ; Indiana War Memorial and Plaza ; James Whitcomb Riley Home ; Line Up at Judges Stand ; Marott Hotel ; Mural Temple ; Robert Long Hospital ; Scottish Rite Cathedral ; Shortridge High School ; Soldiers and Sailors Monument ; State Capitol ; Veterans Hospital. All cards are in excellent condition with no visible wear. The wrapper has only gentle edge wear, and remains intact with no tears or creases.